An article I read in the New York Times somehow transported me to a warehouse of memories in my psyche. As I looked around the "warehouse," I came upon a box which was in an almost forgotten corner. It was neatly covered with duck tape all over, and labeled "RESIDENCY TRAINING" with a red marker. I bend down to take the box, and for a few seconds, embrace it, like a long-lost lover. Doctors who underwent residency training for a chosen subspecialty know fully well that the period of residency is one hell of a rough roller coaster ride. I am one of the millions who can attest to that - being one and a half times a medical resident. Actually, I don't take full credit at all because every soul who underwent training can attest to that. Except maybe for an elite few who just got very lucky in this stage of their medical life. 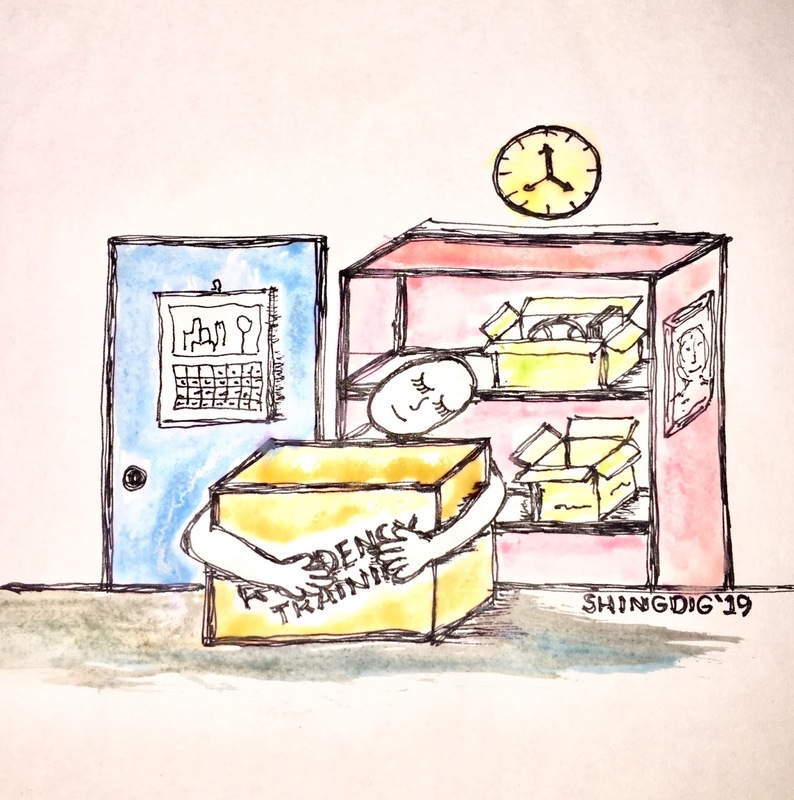 That New York Times article made me look back, and yes - scavenge inside that box - for good memories I had during residency training. One may ask, as quickly as a knee jerk, "Naa diay?!" (Are you sure, there are good memories?!). I will answer to that, "Naa ra man pud." (Somehow, there are good memories during residency training.) - with a smile to match. I consider these moments as "silver linings," - an old idiom that gained popularity lately, thanks to Miss Universe 2018, our very own, Catriona M. Gray - that we hold on to amidst the sea of dark gray clouds or adversities and trials which are the currencies of residency training. When one is subjected to such a stressful environment and lifestyle, I can truly say, the little things count - a lot. My family was a witness to my ordeals then. There was a time when I would air out my sentiments to my sister, and on the following day, when I, - drained from all the day's work - went home to our rented pad, she opened the door for me and shouted with extreme excitement, "Tadaaaann...!!!" --- showing me that our mother had flew in unplanned just to comfort me and encourage me to go on, and to hold on. There were times I would deliberately ask my mother - I remember sending her a text message in the middle of a sea of ECG tracings I had to finish reading - if I made the right decision of starting residency all over again, instead of trying out my luck in the Land of Milk and Honey. My mother would encourage me the way only a mother could. I remember, a fellow resident once asked me if I ever had the feeling of quitting every month. I answered her, "Yes I do have that feeling - everyday." However, not all days are bad, there were days when the sun shone so brightly into my soul that I felt I was in the right place and in the right time indeed. It is actually true when you hear doctors say, a simple thank you from a patient, creates magic in the life of a literally and emotionally-beaten physician, even though for just a few moments. I had this one patient who was a little more extravagant in his thank-yous to the point that he promised to design my clinic once I graduate from residency training. He is an architect by profession. This same patient gave me a giant Toblerone chocolate from abroad - the biggest I have ever seen in my whole life - which he safely kept beside him while he was lying in his bed. He was just transferred to the regular ward that time after a few days of being confined in the Intensive Care Unit (ICU) due to a life-threatening heart attack. I was in my first year of training then (I only saw him at the Out-Patient Department and at the Emergency Room when he came in for attacks of asthma) so he was not under my service, but a nurse told me he was looking for me so I decided to pay him a visit at the ward before I go home. I don't know if it was just me but I saw his face brighten when I entered the room, and like a quick reflex he reached out for something on his side, inside his blanket, which made me think he was hiding something there. True enough, he was. He was actually reaching out for a big bar of that chocolate, which he handed to me with a big smile. He told me that he safely kept the chocolate there since his family and visitors were eyeing on it. That act of thoughtfulness for me was indeed both adorable and touching. In my second year as a medical resident, this fond memory somehow gives me a good feeling for honing and trusting my clinical eye. There was this female diabetic patient who presented to the Emergency Room (ER) for body malaise. She has a background of erratic intake of medications and initial blood sugar tests taken at the ER revealed elevated blood sugar levels. I then insisted that she be admitted. Unfortunately, the patient was hesitant about admission. It is actually the rule (probably an unspoken rule and consensus among patients) to resist admission than to submit to it. I gave the patient enough time to decide, while waiting for the results of the other laboratory tests. Eventually, she gave in, and I, along with her family could not be more thankful that she agreed to be admitted. Laboratory test results showed she was having a heart attack, and if she decided to go home, well it could be that she was ultimately going home to her final destination. What is special about this experience is that I became good friends with the patient's family after this important event in their life when they almost lost their mother. I haven't seen the patient for quite some time now, but her daughter updates me about her and I send my best regards to her as well. Last Christmas, I received another big package chocolate from the patient's daughter who is based outside the country - such remarkable thoughtfulness even when we are on the opposite sides of the globe. More than and beyond those chocolates, what is more important is the bond we have created, a bond that could last a lifetime. It feels good when we unexpectedly make good friends at work. In my last year as a medical resident, my favorite moment is when a brilliant neurologist simply told me, "Very good," when I told her what I did for the management of her patient. Those are just two words - two words that sound ordinary for many but those words were BIG and HEAVY for me, coming from an esteemed member of her specialty and coming from one of the rockstars in our field. She is not the strict type, this consultant, in fact she is very pleasant, but she is not also the type who frequently praises the residents if they or we have done good. I thought at least before I graduate, she appreciated my management, and it feels good to be appreciated and recognized for your efforts even in that simple manner. Now that I am a consultant, proudly serving the government, (which is an entirely different experience for me because I have been trained in and worked for a private hospital since I started) my favorite so far involves this stroke patient. He is a teacher, particularly of the native tongue or dialect. It was just unfortunate that his stroke affected his speech that it became badly slurred, Rhat even us adults had a hard time comprehending it. How much more for his students? If that was not disheartening enough, half of his body was also paralyzed. I was worried and I felt for the patient - he had his family to feed. The best I can do for him, aside from prescribing his medications and encouraging good compliance, was recommend an ample time of rest or leave from work, and also of course, hope for the best for him, that eventually he recovers from his stroke, so that he could get his life and career back on track. Forward to a few months after, I was again at the ICU, and there was this man who came in and asked about securing a medical certificate. I answered his query but I also threw back a question asking him about his diagnosis. He immediately reminded me that he was my patient, the language teacher who got a badly slurred speech after getting a stroke. His speech was perfect! I then asked him about his paralyzed limbs and he extended his arms briskly into the air to proudly show his limbs have regained their normal strength. It was symbolic for me when he did that - raise both his arms up high in the air - it was like a silent but meaningful act of reverence to The Guy up there. The ICU air was filled with sighs and gasps of happiness and exhilaration from the nurses and me when we finally recognized him. I will never forget that moment. I know that I am still a relatively young consultant. I am sure I will encounter more cases in the future, part of those will be memorable because they are pleasant ones, and others will be memorable because, uhhmm they may be filled with a lot of lessons both in life and in career practice. It might be that my favorites now will be overtaken by new and better favorites in the near future. I can only look forward to that, with God's grace and favor. All for the patients who find their way to me as they seek for care.